Chris Vetzel, right, and Wes Dearth, left, conduct target practice. 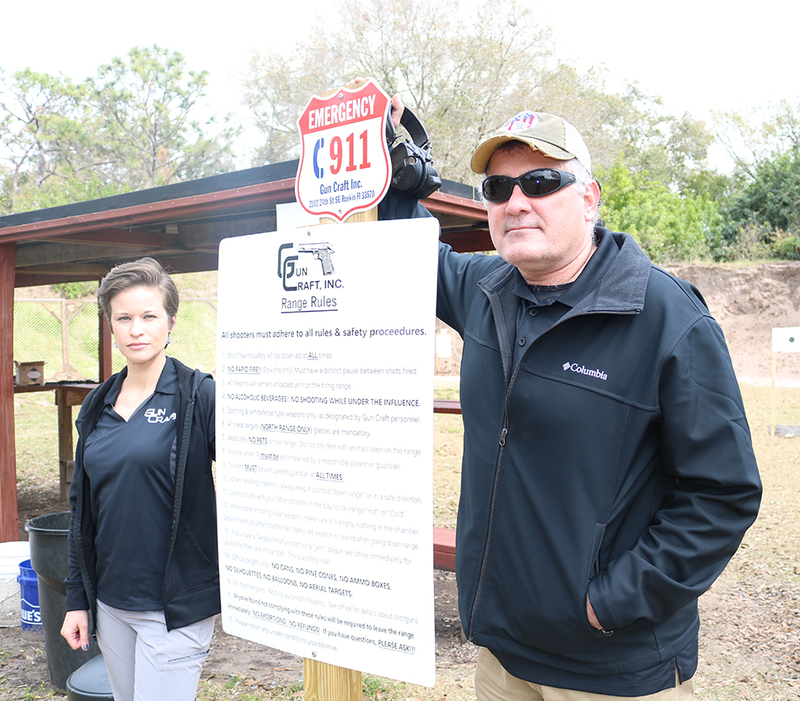 Both are firearms instructors at Gun Craft in Ruskin. One of the oldest — and now most controversial — rights in America is the right to bear arms. In fact, this right is guaranteed by the Second Amendment of the U.S. Constitution. 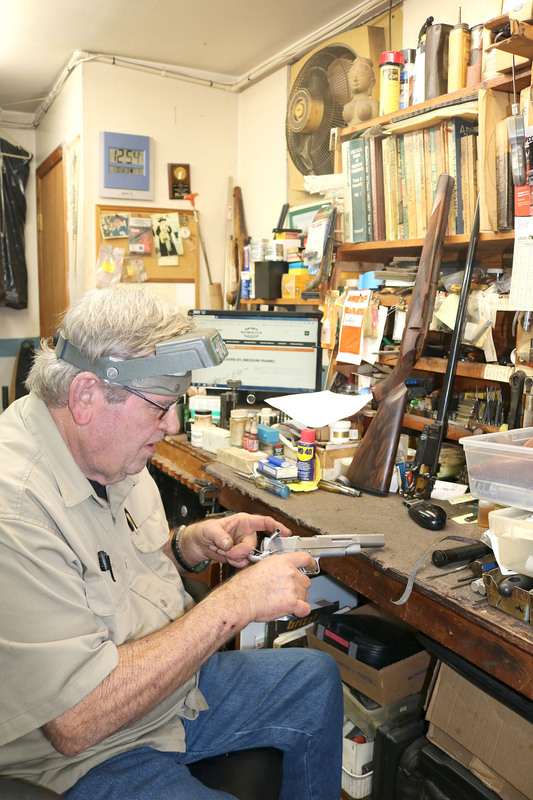 Dave Smith, above, is a longtime gunsmith at Gun Craft. Here he works on a Caspian wide-body competition pistol. Whether for hunting, collection, or self-defense, anyone who owns a gun should certainly know how to use it responsibly, legally and safely, and also be aware of the laws and regulations concerning guns and concealed weapons. That is one of the main purposes of a business in the outskirts of Ruskin. 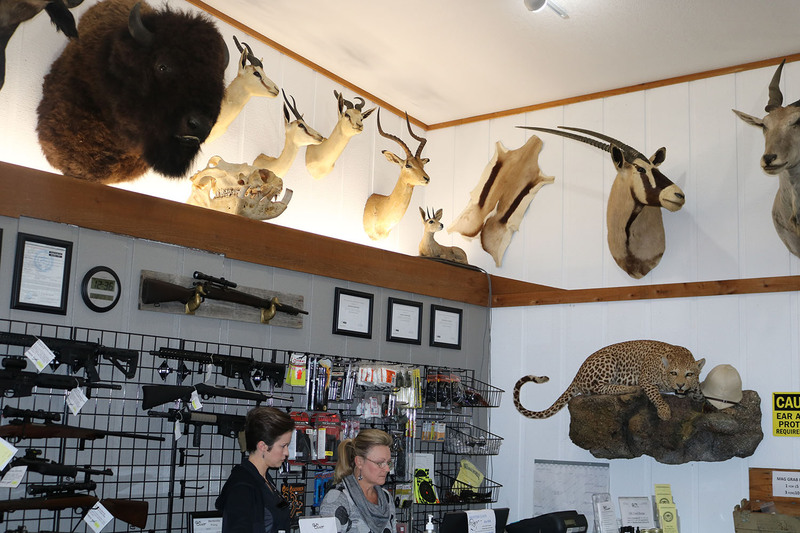 The Gun Craft club sports an outdoor shooting range, gunsmiths, educational and license classes, an ammunition and accessories retail store, and a fantastic taxidermy collection of the late owner’s trophies of big game hunting. All this is located on 10 acres at 2102 24th St. S.E. in a mixed rural-suburban area in Ruskin. The late Ben Jones owned a farm and ranch service with his wife Kay, a schoolteacher, now retired, previous to starting Gun Craft in the early 1980s. Ben, an avid and prolific big-game hunter in Africa, South America and North America, passed away in August 2018. His son, Paul Jones, has stepped in to continue his late father’s legacy. Paul also owns and operates Central Florida Frame and Axles, a heavy-duty truck repair shop in Tampa. Paul has plenty of family help in the day-to-day management of Gun Craft, from his wife Carolyn, his daughter Bonnie Shepherd and his son Timothy Jones, all committed to Ben’s legacy and to improving the range and shooting facilities at Gun Craft. Bonnie Shepherd, left, and Carolyn Jones, her mother, in the retail area of Gun Craft among the many taxidermy trophies of the late Ben Jones, former owner and founder. 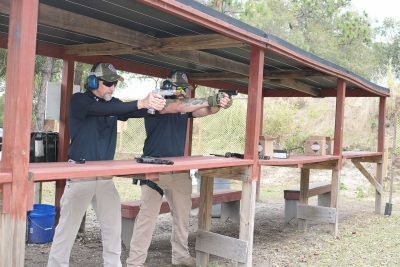 Located in a somewhat secluded area of farms and residences just north of the Little Manatee River, Gun Craft includes three 35-yard shooting ranges and a 100-yard shooting range. Gun Craft is a membership-only club that is open to the public with memberships available for purchase. Several shooting clubs and organizations stage competitions at Gun Craft weekly or monthly. One of the important services is the monthly Concealed Weapon License class, with many class styles available, which are held in the new classroom and on the range. Gun Craft is affiliated with the NRA, the Single Action Shooting Society, the Tampa Bay Suncoast Pistol Club, the King’s Point Sportsman’s Club and the South Shore Chamber of Commerce. Paul added that he sees positive and continued growth for South Shore and strong and continued community interest in firearms and shooting. Bonnie Shepherd, left, manager of Gun Craft with Dan Hilty of Pittsburgh, a visitor, in front of the shooting range. Among other services, Gun Craft not only sells guns of a wide variety, but has on hand a pair of experienced, qualified gunsmiths: Dave Smith and Chris Vetzel. “We offer everything from simple cleanings to part installation to more complex custom work,” said Paul.